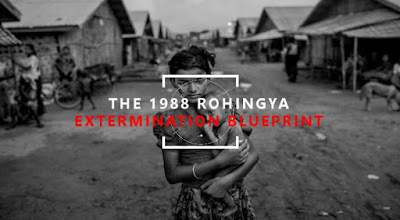 The 1988 Rohingya Extermination Plan was first proposed by Col. Thar Kyaw who was an ethnic Rakhine and the first chairman of National Unity Party (NUP), a proxy party of Burmese military and former Burma Socialist Programme Party (BSPP) formed to compete against National League for Democracy NLD during the 1990 general election. The plan was adopted by the Burmese junta’s State Law and Order Restoration Council (SLORC) in 1988 and continued under State Peace and Development Council (SPDC). The successive military regime has carried out the 11-point extermination blueprint against Rohingya Muslim minority. 7. To forbid them from ownership of lands, shops and buildings. Any such properties under their existing ownership must be confiscated for distribution among the Buddhists. All their economic activities must be stopped. 11. Mass killing of the Muslim is to be avoided in order not to invite the attention of the Muslim countries. 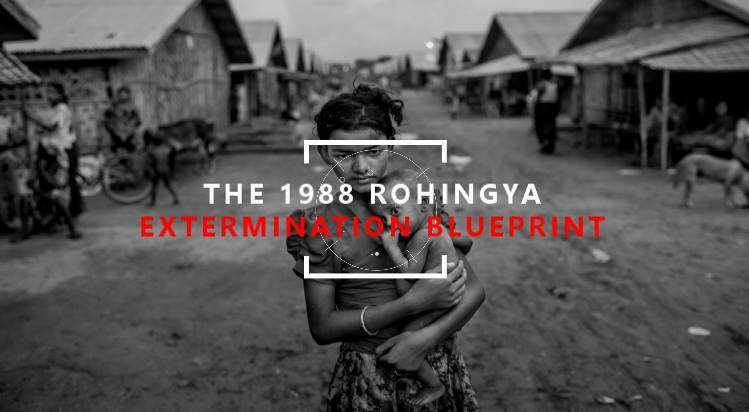 Since its inception, the blueprint is a driving force for the military regime, Thein Sein’s quasi-civilian government and even Aung San Suu Kyi led NLD government in persecution of Rohingya. The ongoing “clearance operations” in northern Maungdaw is an example of deep-rooted decades-long extermination campaign against the marginalized Rohingya. The blueprint still remains one of many institutionalized policies largely instrumented against the entire community.